Climate change is driving more extreme weather events around the world. To assist firefighters coping with these effects, innovative technology collaborations, wider adoption of high bandwidth Ka-band satellite systems, and more compact and flexible vehicles and systems, are likely to drive future developments in fire and rescue services. Many of the issues raised during major fires and flooding incidents are familiar to those in the emergency services who have to cope with the consequences – large-scale disruption to people’s lives, loss of life, destruction of urban and rural terrestrial communications networks, and damage to properties, businesses and transport networks. The emergency response management challenges are also familiar, but are likely to become more critical now that extreme weather events are becoming more common. These include how to ensure delivery of joined-up communications and command and control systems to create and share a common operational picture across all participating emergency response organisations during major single and multi-agency incidents; and how to mobilise organisations, resources and people quickly, flexibly and effectively to deliver emergency support to communities, families and businesses where it is most needed. In the UK, for example, participants in emergencies can include: fire and rescue services, police forces, ambulance services, COBRA (the central government emergency response committee), central and local government departments (the Environment Agency, the Transport Department, surface rail and underground rail companies) and supporting agencies, the armed forces, Gold, Silver and Bronze commands, NGOs (non-governmental organisations) such as the Royal National Lifeboat Institution, RSPCA (Royal Society for the Prevention of Cruelty to Animals) Red Cross, plus local community groups and individuals. During major disasters and emergencies, emergency services, government departments and agencies need high bandwidth, robust, integrated emergency communications to support their command, control and coordination systems. These are used to assess threats and to manage, coordinate and deploy public safety resources efficiently across all single and multi-agency emergency command levels, both locally and nationwide. One solution used to support this activity is high bandwidth Ka-band mobile satellite broadband systems from companies such as Primetech. These are being used to deliver robust, reliable voice, video and internet communications in the field, including high definition incident and command centre video, internet access and GIS (geographic information system) mapping, as well as to facilitate interaction between incident command decision making systems, such as VectorCommand’s command support system. From flood and fire zones at local command level on up to departmental and agency HQs, Ka-band communications solutions can deliver the critical emergency command, communications and computing networks fire, police, ambulance services and central and local government departments and agencies and the armed forces need to perform their difficult tasks to the best of their ability. Mobile incident command units, such as the unit supplied in the UK to Surrey Fire and Rescue Service, are now able to send full high definition video from the command vehicle back into the command headquarters over the Ka satellite system. This is a radically new development, made possible by the higher data carrying capacity of more modern Ka-band satellite systems. Mobile incident command units are now able to send full High Definition video from the command vehicle back into the command headquarters over the Ka satellite system, and newly developed wide area incident ground WiFi units enable better use of ruggedly engineered tablets. Such units can help manage resources, people and equipment as well as accessing television news services, risk database information, command, control and resource management systems, GIS mapping and imagery for creating and maintaining a common operational picture, delivered quickly, efficiently and accurately. Other technology on the Surrey Fire and Rescue Service vehicle includes COFDM (coded orthogonal frequency division multiplexing) cameras. Body-worn, tripod and mast-mounted cameras can send imagery via COFDM to both the main vehicle and support vehicles, and then on up to higher commands. Newly developed wide area incident ground WiFi units enable better use of ruggedly engineered tablets (such as the Panasonic Toughpad) and laptops for improved information gathering and sharing, and effective coordination and deployment of people and resources. Primetech’s own incident ground WiFi solution is a COFDM drop-down unit housed in a small, battery-powered Peli case. The delivers the benefits of WiFi and overcomes the limitations – WiFi access can be limited because it is a very congested network. Using the Primetech system, a COFDM/MESH node can be taken away from the command vehicle and positioned so that it can create a link from the box back to the command unit. Within the confines of that COFDM drop-down unit the company has installed localised 802.11 connectivity. Effectively, the Cobra cold cutting system delivers localised 802.11 connectivity to the COFDM unit and then the signal rides on the back of the COFDM frequency back to the command vehicle. 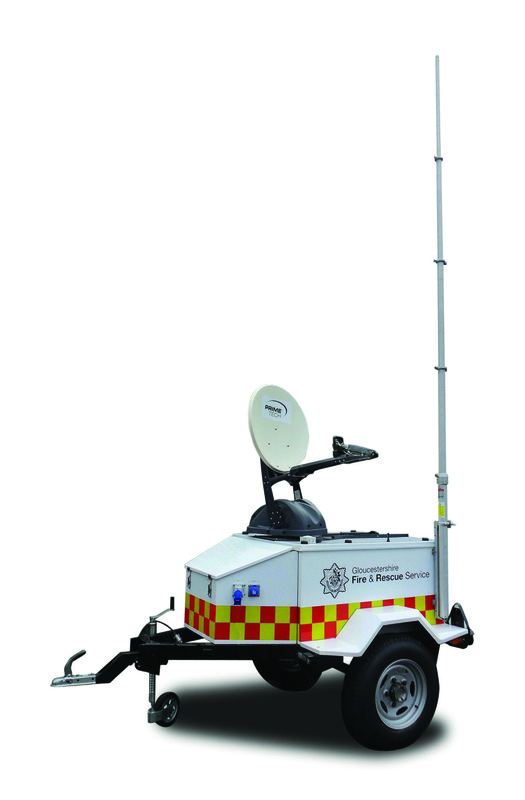 A resilient communications trailer provides satellite and wireless communications backup when emergency services and agencies need to set up temporary command and communications centres – in community centres, schools, offices or temporary shelters – or to supplement existing communications systems with extra capacity. Towable by vehicles of any kind, the trailer is a self-contained, flexible and resilient communications unit that can deliver high bandwidth capability, in any location, via an auto-seeking Ka satellite system, with multi-VPN automatic 3G failover and wireless communications from a five-metre pneumatic mast. Use of the trailer frees up larger command vehicles, essential during large-scale, wide area, multi-site and multi-agency emergencies. Another smaller scale, more flexible unit is the recently launched Cobra Rapid Response Strike Vehicle, Primetech’s completely new firefighting platform that gives fire and emergency services a powerful and flexible weapon in their battle against fires. It is based on a Mitsubishi Trojan platform, is designed to pack a huge amount of punch by carrying the unique Cobra cold-cutting firefighting system, the Cobra Multi Purpose Nozzle, Ka mobile satellite broadband and HD video, incident ground WiFi and body-worn cameras. The system delivers high pressure water mixed with a cutting agent (abrasive) that can cut through all known building and construction materials and allows firefighters to fight fires safely from the outside of the building. The lance delivers a precise mixture of water and abrasive through a 2.3 millimetre nozzle, which allows the vapourised water to then be pushed into the building.